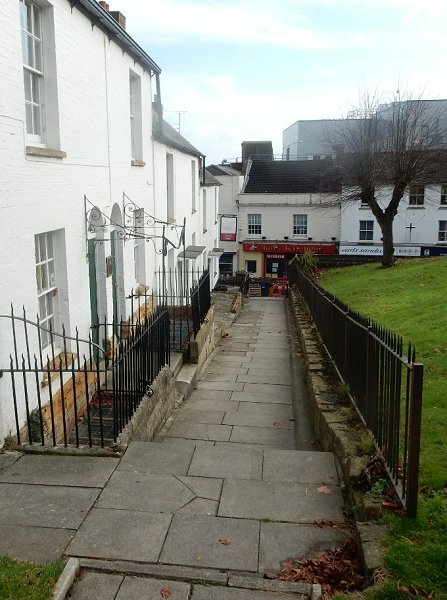 Church Terrace is a terrace of houses, now all offices, dating to the late 1830's, approached via a flight of stone steps from Silver Street. In its early days, at least until the 1880's, it was known simply as Church Yard. 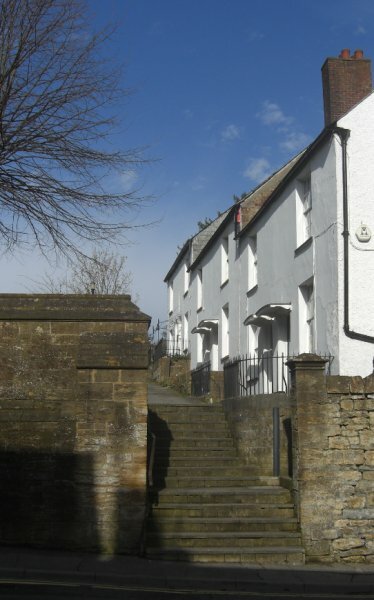 Nos 1 to 4 are rendered and colour-washed while Nos 5 and 6 are colour-washed brickwork, all under Welsh slate roofs with plain verges to the gables. The terrace is built in stepped pairs, of which Nos 1 and 2 are the lowest. 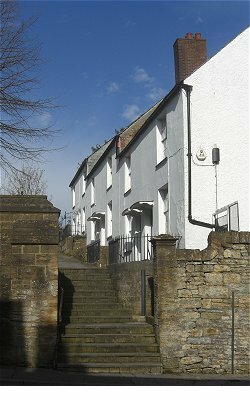 Each house is of two storeys and two bays with central doorways on either side of the party wall with segmental porch hoods on simple wooden brackets to Nos 1 to 4 and wrought iron brackets for curved porch hoods remain (most likely not original) but the hoods have gone. The windows are 16-pane sashes, one to each floor of each house, with all glazing bars intact. There are boundary railings to both Nos 1 and 2, those to No 1 apparently original. Nos 3 and 4 have no railings while those to Nos 5 and 6 are more ornate and almost certainly early nineteenth century as are the railings on the churchyard side of the footpath. An indenture of 1751 describes the plot before the present houses were built "One garden or close, heretofore an orchard with a Barne thereon containing by Estimation one Acre lying and being behind the church of Yeovill, and one Plott of Wast Ground now or late a Smith's Shop or Forge standing thereon heretofore in the occupation of Thomas Mead and adjoining to a well called Nune Well late in the tenure of John Day, and also all that new erected Shop and Chamber over the said Shop in Yeovil next adjoining to the Said Cottage now or late in the tenure or occupation of Matthew Cheed." There were cottages on the site before the present ones, owned by the Daniell family. 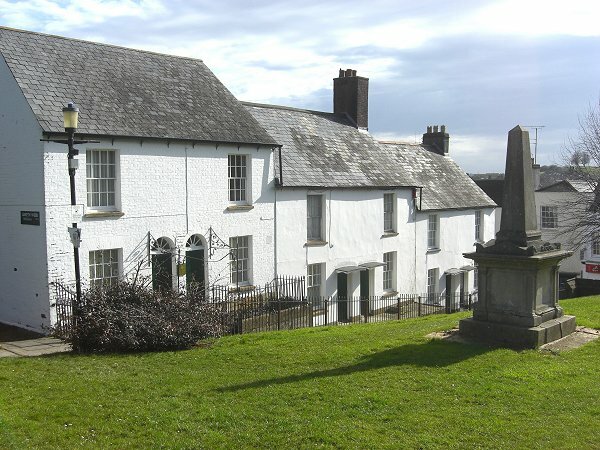 In his will dated 1763 William Daniell wrote "I give unto my loving wife all my Dwelling Houses which I am possessed of behind the Churchyard in Yeovill with their and every of their Appurtenances for the term of her natural Life". After Margaret Daniell died the houses passed to her son Samuel Daniell and then to Samuel's nephew Peter Daniell. Between the cottages and Church Path was a garden also owned by William Daniell "As to my Garden Plot behind the Churchyard lying between the said House I give the said Garden Plot to my my loving wife for the Term of her Life and after her decease I give the said Yard Garden Plot with all its Appurtenances to my Daughter Jane Daniell her Heirs and Assigns for ever". 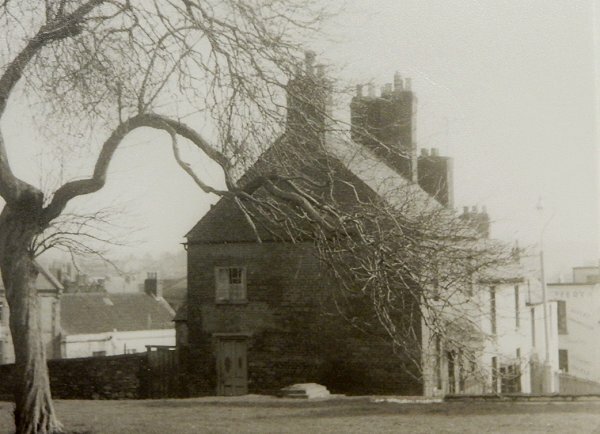 These cottages and garden plot were sold off in order to extend the churchyard and the Churchwardens' Accounts for 1825 record "At a Vestry duly convened for taking into consideration the expediency of enlarging and inclosing the Church Yard in pursuance of the Directions of the Lord Bishop of the Diocese, held this nineteenth day of September 1825 It was unanimously resolved - That it is expedient to enlarge the Church Yard: - That the offer now made, on the behalf of Mr (Peter) Daniell to sell to the Parish the Cottages and gardens within the Paling which divides the land in the possession of Mr Mitchell (North Lane House?) from the said Garden for £525 be acceded to." The cottages were demolished and the Churchwardens' Accounts for 1827 record "Rec. of Mr Thomas for the Materials of the old cottages £13.0.0." In April 1828 Mr Wellington paid the churchwardens £7 for "Stone, Old Glass, &c." apparently salvaged from the cottages and the 1828 disbursements contain a considerable number of entries for "Work in C.Yard, Hauling Earth, Hauling Stone in C.Y." and "Taking Rubbish from the Church Wall." This work continued until April 1828 and in 1832 the land on which the cottages had stood had been taken into the churchyard and was consecrated. The present Church Terrace was most likely constructed at this time. According to the 1841 census the new terrace was occupied by slightly more affluent families; plumber William Emery, draper William Neale, artist EW Stanton, glover Luke Burton, painter James Hannay and their families, a total of forty two people. By the time of the 1851 census the terrace was occupied by cooper John Searle, sexton John Watt, glover Edward Leach, baker Robert Wills, van driver George Brown and their families, a total of thirty one people. In 1861 the terrace was occupied by gunsmith Francis Booth, chair maker Simeon Watts, sexton John Watt, glove cutter Robert Trask, dressmaker Sarah Wolson, glove cutter William Braiby and their families, a total of thirty people. The 1871 census listed the families of glover William Clements, coach smith Henry Foan, mason Thomas Hellard, chair maker Simeon Watts, glover Thomas Dodge and coachman Joseph Purchase - a total of thirty three people. In the 1881 census the terrace was referred to both as Church Yard and Church Terrace and contained the following families - laundress Ann Sparks, labourer George Read, Simeon Watts now a School Attendance Officer, glover Thomas Dodge and glover Frederick Thorne. A total of thirty two people. By 1891 it was known as Church Terrace and was occupied by the families of widow Mary Farley, baker William Gibson, leather glove cutter Henry Tavener, Louisa Watts the widow of Simeon, leather dresser Thomas Dodge and glove cutter Frederick Thorne - a total of just twenty one people. From 1901 the census included Church Terrace within Silver Street generally. 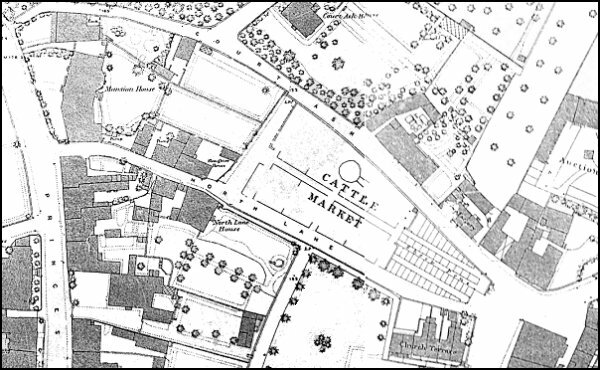 E Watts' map of 1806 shows the cottages occupying the site of the later Church Terrace. 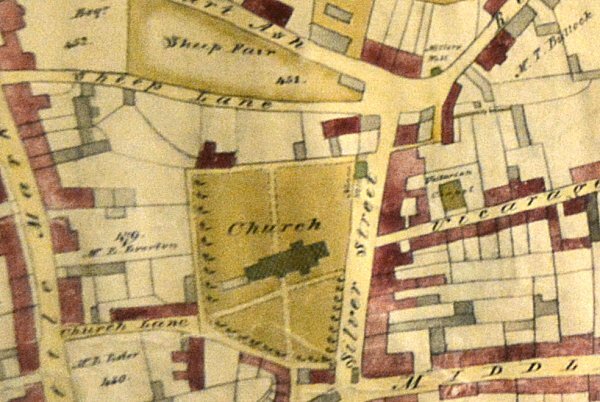 At this time the cottages and the land between the churchyard and Sheep Lane (today's North Lane) were owned by the Daniell family. The 1886 Ordnance Survey showing Church Terrace at bottom right. 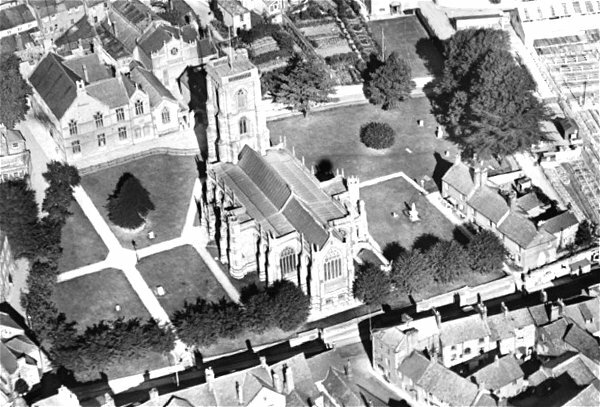 An aerial photograph taken in 1928 featuring St John's church at centre and the stepped terrace of Church Terrace at centre right. 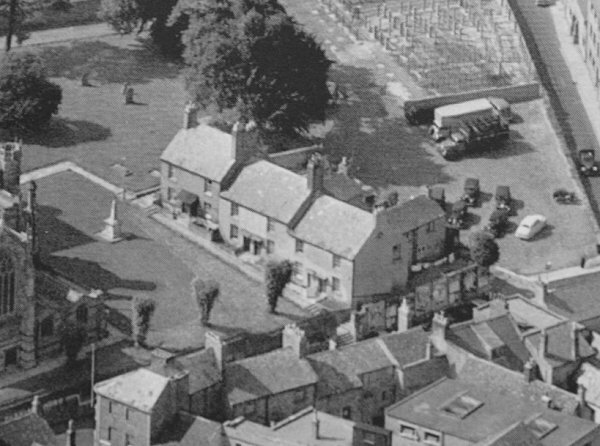 An aerial photograph of 1955 of Church Terrace - probably the last time the porch on the pair of cottages at left was complete. 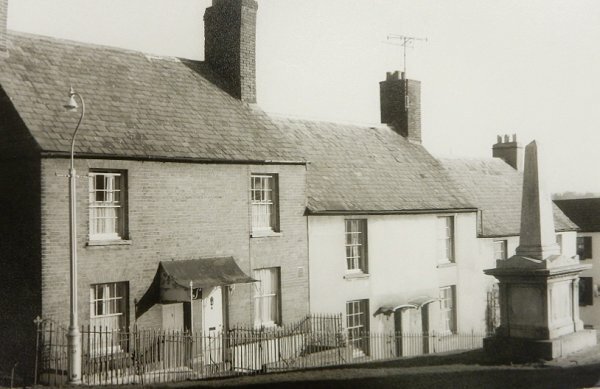 Church Terrace photographed from the churchyard, probably in the 1950s. .... and a more frontal view from around the same time. Notice the first two houses at left in natural brick finish, before being painted. 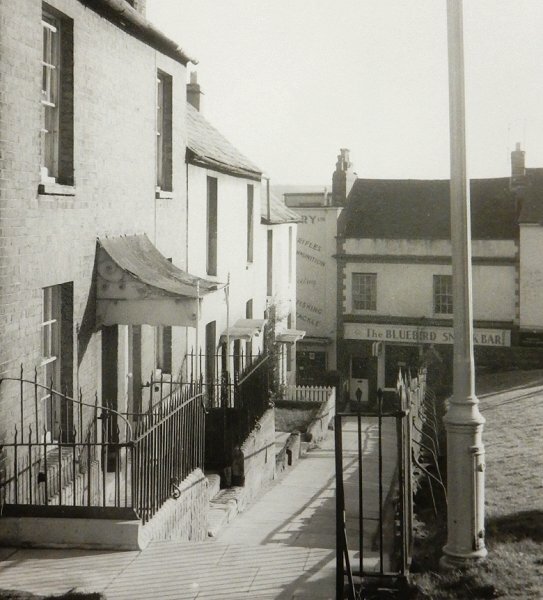 Looking east along Church Terrace - note the complete Regency-style porch over the nearest two doorways and the Bluebird snack bar in Silver Street. 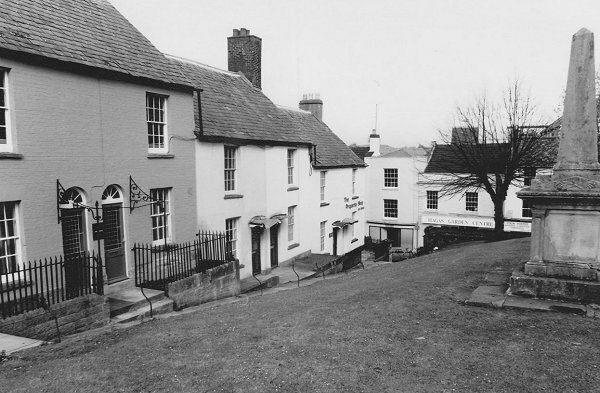 Church Terrace photographed from Silver Street in 1985. 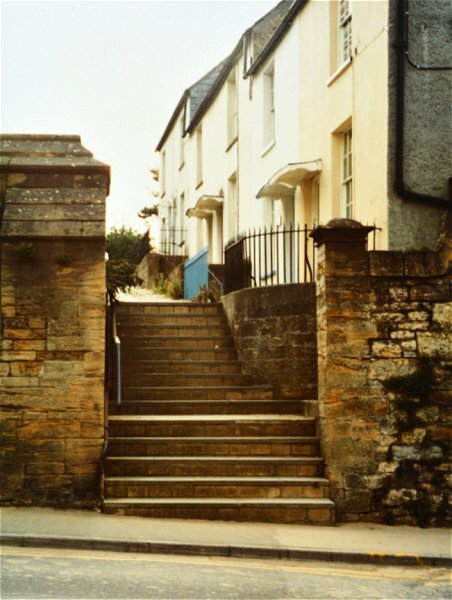 Church Terrace, photographed in 1990 when they were different colours (or at least different shades of grey). 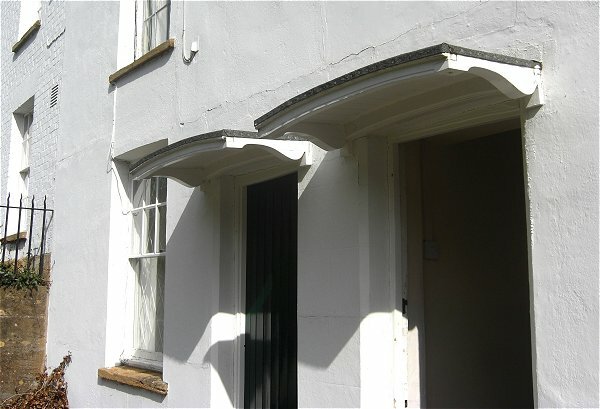 It appears that the Regency porch over the entrances to the first two cottages was broken nearly a quarter of a century ago - you'd have thought someone would have had a go at repairing it by now. 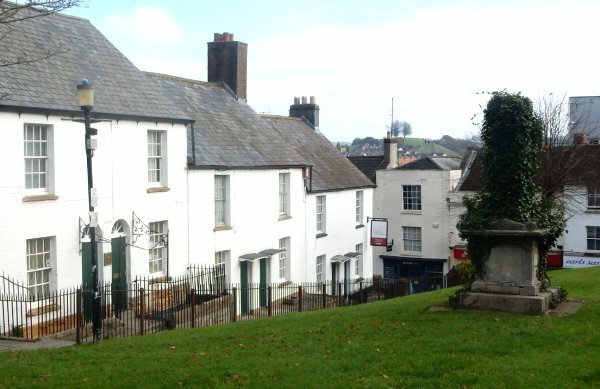 Church Terrace and the obelisk tombstone of Mary Vining, first wife of James Tally Vining, who died in childbirth. It was erected by him on the north side of St John's church by Church Terrace. Photographed in 2013. Sadly, Mary Vining's tombstone has been allowed to become overgrown with ivy. Photographed in November 2016. Detail of the Regency-style canopies. Photographed 2013. Church Terrace photographed in 2016. You'd have thought that by now somebody would have replaced the missing Regency-style porch over the nearest two doorways. Church Terrace photographed from Silver Street in 2017.